On Friday 18th of May, in the presence of the Minister of the Public Administration and the Innovation, Renato Brunetta, Roy Capasso, marketing manager of Cantieri di Baia, received the “Forcola d’oro” award for the One Hundred, the first superyacht built in Campania. Expo Venice spa and Fondazione Valore Italia wanted this prize, this year at the first edition, in order to encourage and exalt the Italian style and the excellence of the made in Italy in the nautical world. The choice for Baia One Hundred was for its research to innovate the morphology of the spaces of the deck. They were never organized in this way until now. The innovative solution of continuity between the inside and the outside surprised the jury in a particular way. Also this year Cantieri di Baia took part at the famous Rolex Capri Sailing Week with One 43’ and Azzurra 63’. Once again Cantieri di Baia demonstrated to be up to the greatest names of the international sailing world that every year take part at the Rolex Capri Sailing Week. It’s a confirm of the well-established partnership between Cantieri di Baia and the sailing word. Last June Cantieri di Baia presented the new Baia book. 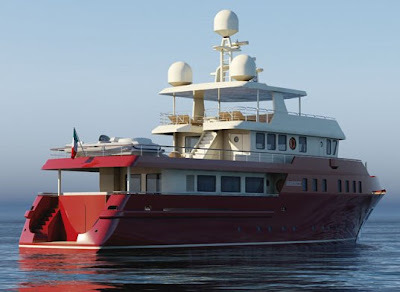 It is the Cantieri di Baia’s story. It started in 1972 when Capasso family acquired the shipyard. It narrates the evolution of this reality that with the time has become a real trend setter in the international nautical world. At the same time, however, Cantieri di Baia constitute a value added for their territory, in fact they maintain the whole production process in the Neapolitan gulf. 160 pages and 140 images describe the changes of the shipyard since Pascià, first boat of Cantieri di Baia made in fiberglass that was completely lined with teak staves. The story continues until the last great success of Cantieri di Baia, the Baia One Hundred, that is the first superyacht built in Campania, and it takes into consideration also the rich and appreciated line of Life Style products, signed Baia. Bayliner Boats is proud to announce that for the second year in a row, Bayliner will receive three prestigious Customer Satisfaction Index (CSI) Awards from the National Marine Manufacturers Association (NMMA), the leading association of the recreational boating industry. The NMMA’s Marine Industry CSI program recognizes marine manufacturers whose pursuit of excellence and continuous improvement earns them overwhelming customer support. Matching its performance in 2008, Bayliner received 2009 awards in the following categories: deckboats, sterndrive bowrider boats, and sterndrive cuddy and express boats. Companies must actively measure customer satisfaction for award consideration by the NMMA. Upwards of 60,000 consumers participated in the industry-wide 2009 CSI Awards surveys. To receive its three awards, Bayliner achieved customer satisfaction ratings of 90 percent or higher over the past year. 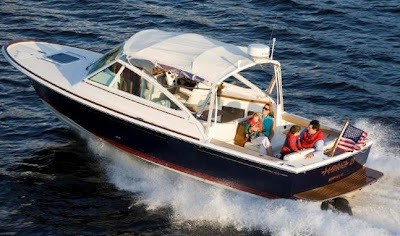 Customer satisfaction is measured independently, and based on information provided by all consumers who bought a new Bayliner between April 1, 2008, and March 31, 2009. Bayliner’s impressive repeat performance is the latest in its long history of winning over customers. The company has received several CSI awards in recent years, including sterndrive bowrider and deckboat awards as well as an award in the fiberglass outboard category. The NMMA will acknowledge Bayliner and the other CSI Award recipients during the 2009 International BoatBuilders’ Exhibition and Conference (IBEX), Oct. 12 - 14 at the Miami Beach Convention Center. Fountain Powerboats has filed for Chapter 11 bankruptcy protection in the US Bankruptcy Court in the Eastern District of North Carolina. According to court documents, Fountain will attempt to sell its assets, including the facilities and tooling in North Carolina, as well as brand names and unsold inventory for the Fountain and Baja brands. It expects the assets to sell for between US$6m and US$8m. Fountain said it owes its largest creditor, Regions Bank, US$19.6m. About US$4.3m of the total is for floor-plan loans, while the other US$15.3m was for term loans and a revolver loan. The company reported a loss of US$2.2m in fiscal 2008, and US$8.1m in fiscal 2009. The company's two biggest shareholders are Cede and Company which owns about 2.2m common shares, and Chairman and CEO Reggie Fountain, who owns about 2.1m common shares. The company intends to continue operations, according to the court documents. Reggie Fountain told local news sources that only about 10 to 12 workers will remain on the site in the coming weeks. He also expects the backing of new private investors to be in place by the end of the month. The court documents said Fountain's current operations would not be sufficient enough to support a traditional reorganization. Italian Yachts SpA, the company owning and building the “Jaguar Yachts” is particularly active in its expansion with important developments to upgrade is dealer networks in Italy and in other countries. In this format Italian Yachts organized its dealer meeting, that was located in the Porto Antico of Genova, where the company has its administration and sales offices. The occasion could not have been better where to company could show the newly launched Jaguar 80 to the special guests. This Super Sport Yacht will be officially presented to the public in the coming boat shows of Genova and Cannes. At a production level Italian Yachts also announced that in the building facilty of Massa Carrara, there is also further new models in construction like the new sporty Jaguar 72 and the 92 Jaguar, new flagship of the range. The success of the critics of the last two years of the Italian Yachts Jaguar open series has been testimony of a brand which has escalated to a rapid growth on the international yachting scene. Kadey-Krogen Yachts will host their annual West Coast Open House October 2-4, 2009, at their new Seattle office location at the Salmon Bay Marine Center, 2288 West Commodore Way, Suite 220, Seattle, WA. The Open House is for those who are looking to start their search for a cruising powerboat as well as cruisers who are interested in becoming more familiar with the Pure Full Displacement trawlers that Kadey-Krogen builds. Attendees will visit some of the most popular among the company’s trawlers and have an opportunity to spend time aboard each boat comparing features as well as have the chance to sign up for a short ride aboard a Krogen 44’ as part of the weekend experience. In addition to the 39’, 44’, 48’ and 58’ that will be on display, the event will be the West Coast debut of the new 55’ Expedition with hull number two on the docks. In addition to the Open House event, Kadey-Krogen Yachts is hosting a hands-on engine training seminar in collaboration with John Deere and Northern Lights on October 2-3, 2009. The seminar will be held at the Cascade Engine facility in Tukwila, WA, about 45 minutes from the Kadey-Krogen office. The seminar will be headed by Bob Senter, Greg Light, and the staff at Cascade Engine. Though the Open House is free to attend, there is a cost for the training seminar and the number of participants will be limited. The Kadey-Krogen Open House will run from 10 a.m.-5 p.m. Friday-Saturday and from 10 a.m.-3 p.m. on Sunday. The event is free and open to the public and the media. Anyone interested in joining the cruising-under-power lifestyle will appreciate the chance to go aboard Kadey-Krogen yachts ranging from 39 to 58 feet with knowledgeable and qualified sales representatives from Kadey-Krogen. Maritimo completed the 2009 Sydney International Boat Show with sales success across its range. The new flagship Maritimo M73 Motoryacht drew massive crowds throughout the five-day show, spilling through the company’s marquee and on to the walkways. The new silver-hull flagship headed Maritimo’s largest ever on-water boat show display of 13 boats valued at more than $25 million. Maritimo also unveiled the A50, the second of its sporty Aegean Enclosed Flybridge models. According to Marketing Director Luke Durman, boating enthusiasts arrived at the show ready to do business. Brunswick has made the decision to discontinue production of the Maxum brand, and has notified dealers. This decision emerged from continuing efforts to review every aspect of Brunswick operations, including brand portfolio, in an effort to position it to emerge from this downturn a stronger company. It was a difficult, but necessary, decision, driven and based on economics. Maxum will sell boats currently in inventory, and will not have production for the 2010 model year. Brunswick remains committed to the marine industry, and continues to offer its dealers and consumers one of the widest arrays of boating options through our marine portfolio. Support for the Maxum products will continue throughout the warranty period. We intend to support our Maxum consumers. There will be no change to the type or level of warranty service, parts and support provided to the Maxum dealers at this time. We are offering the dealers an opportunity to continue with the significant retail and wholesale incentives that have been in place during this selling season to support the dealers’ retail efforts. We also will be providing each Maxum dealer with an opportunity to participate in an extended support program intended to help dealers wind down their Maxum business over the coming months. The Menorquin Llaüts have been designed according to tradition and for their seafaring qualities, created for those who enjoy relaxed coastal sailing from cove to cove, anchoring at leisure, joining up with friends or the pleasures of recreational fishing. Now, after various years of externalizing the manufacture and sales of this range of vessels, Menorquin is to take on these tasks once again from its headquarters in Menorca. The Menorquin Llaüts are the very boats which gave rise to the birth of the shipyard over 30 years ago. The overall boat lengths range from 5 to 8 metres and are characteristic because they retain the traditional style of the typical Balearic fishing boat, or llaüt. Over the years Menorquin has worked to incorporate improvements in to the manufacture of the Menorquin Llaüts to achieve a product which meets the highest quality standards and has become a distinguished brand in this segment of the nautical market. Some years ago the shipyard opted to externalize the manufacture and sales of this range in accordance with the company’s business strategy of the time. Now, in response to changes in the requirements of the recreational nautical industry and to aid its recovery through the launch of new business formulas, Menorquin has decided to internalize these procedures once again at the shipyard facilities on Menorca. Menorquin Llaüts are very suitable for those just getting started in the nautical world, they are characterised for their ease of handling, sound performance and safe sailing qualities which are indispensable for living out a passion for the sea from the very first voyage. Menorquin Llaüts offer a variety of attractive features for those who prefer to sail without haste, at a cruising speed of 7 knots. They are boats which as a result of their very individual character and style draw much attention and are very popular with nautical tourism. Thanks to their hull shape with a very small draft, these craft are able to navigate through very shallow waters, close to beaches, making it easy to disembark and explore on dry land. Meridian Yachts recently received a Marine Industry Customer Satisfaction Award for the 2009 model year from the National Marine Manufacturer’s Association. This is the second consecutive year Meridian Yachts has received the honor, which is based on achieving and maintaining an independently-measured standard of excellence of 90 percent or higher in customer satisfaction over program year. 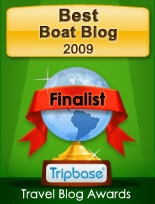 Meridian Yachts was recognized in the Inboard Motoryachts and Trawlers sub-category. Out of the 105 boat and engine manufacturers that participated in the NMMA program, only four brands – including Meridian Yachts – were recognized with Customer Satisfaction Awards in bridge boat categories. Meridian Yachts has experienced remarkable success in recent years. In 2008, Meridian became the best-selling bridge boat brand in the USA and received its first Marine Industry Customer Satisfaction Award. The brand continues to excel in 2009 with segment-leading sales and this second national customer satisfaction award. 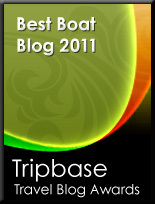 The award is based on information provided directly by the customers who purchased a new boat and engine during the period between April 1, 2008 and March 31, 2009. 2009 CSI award recipients will be formally acknowledged during the annual International Boat Builders’ Exhibition and Conference (IBEX) taking place October 12 to 14 at the Miami Beach Convention Center in Miami Beach, Fla.
Morgan Yachts, the brand of Aicon Group specializing in the design, construction and marketing of yachts in the Dinghy, Lobster Boats and Fast Commuters segments, has finalized its second Ambassador partnership agreement with Barke Bonom for the sale of its classic motor yachts range in Eastern Europe. Barke Bonom will be an authentic representative of the Morgan brand in the Northern Adriatic area and in Eastern Europe. The agreement signed confirms the Morgan will to develop a strong and exclusive network of partners all over the world, which will be, as the name itself means, Ambassadors of the Morgan’s brand and philosophy in their each country. Barke Bonom has the head-office based in Zagreb, Croatia and a second office in Brezice, Slovenia. Its offices will be a meeting point for all the potential clients and shipowners that represents access to the Morgan’s world. Outer Reef Yachts has revealed that it can now build any of its long-range custom motoryachts to Australian Commercial Survey. A recent sale of one of its new 21m (70ft) models to an experienced yachtsman requested the yacht be built to Queensland Commercial Survey so the yacht could be put into charter in Northern Queensland. Although Outer Reef currently builds many of its boats to different classifications, including Bureau Veritas (BV), very few builders will take the effort and devote the management to build to class or survey in the under 30m (100ft) range, the company claims. Once again, and still in London, Riva confirms its strong relationship with the automobile world that, since the 50s, has been a reference point in the design of its famous yachts. In the enchanting frame of the Georgian Hurlington Club in London, a specimen of the “spider of the sea” Aquariva, stood out among the luxury objects displayed at the Salon Privé, that took place from the 21st until the 24th of July. Thanks to the collaboration of Riva’s exclusive dealer for Great Britain, Ventura UK, guests had the chance to admire the iconic model of Riva range. Now in its fourth year, this one represent the most exclusive Super Cars event and Concours d’Elégance in the UK: an occasion during which the lucky attendees can admire from closer luxury vintage and modern cars displayed. Among the important brands of different luxury fields, Riva was the only representative for the worldwide nautical industry at the event, and obtained a great success. Australia’s largest luxury boat builder, Riviera, has reaped the rewards at this year’s Sydney International Boat Show with an astounding $8.7 million in sales. Riviera’s chief executive officer, John Anderson said the results proved there was strong support for Riviera in the current market. Riviera launched two exciting new models; the 51 Enclosed Flybridge with triple Volvo Penta IPS and an entirely new flybridge design and the 5000 Sport Yacht with Cummins Mercruiser Zeus drives – the first production boat in Australia to carry this new pod drive system. The 5800 Sport Yacht and 3600 Sport Yacht with IPS made their debut at the Sydney International Boat Show. Once again the ‘I Love Riv’ team was a huge success at the show with more than 7,000 ‘I Love Riv’ stickers being requested by visitors to the Riviera stand. The launch party held on the floating display on Saturday night attracted more than 250 owners who showed their support and dedication to the company whilse inspecting the latest expressions of Riviera’s innovative designs. Professionalism, enthusiasm and sales results always go above and beyond expectations, which is why Matthew Willet has been awarded Riviera’s Salesman of the Year award for Australia and New Zealand. For the past seven years Matthew has seen the full cycle of the marine industry and is elated with his success at Riviera’s Dealer Awards held at the Sydney International Boat Show. Riviera Chief Executive Officer, John Anderson said Matthew also won this title in 2007, which was a credit to his hard work, and determination. The Dealer Awards were held this month and have been running for the past 15 years and are designed to recognise outstanding achievement and dedication to the Riviera brand. Dealer of the Year was awarded to R Marine Sydney for having the highest number of new Riviera sales and deliveries in the 2008/2009 Australian financial year as well as outstanding customer feedback. Mr Anderson said R Marine Sydney sold more than 25 new Rivieras and more than 70 trade boats in this period. Service Person of the Year was awarded to Jon Dodds from R Marine Pittwater, located in Sydney’s northern beaches, for his total customer satisfaction and tireless dedication to Riviera. Pittwater dealer principal Bruce Mitchell said Jon played a huge part in the ongoing success of the Pittwater dealership and has maintained the highest service levels throughout the 12-month period. Sunreef Yachts has just launched Blue Reef Yachts, a new brand on the motor yachts market specializing in medium-sized practical and rational monohull power yachts. In response to demanding clients with a passion for traversing the seas, Blue Reef will offer a range of timeless, comfortable and easy to handle yachts without crew designed by top experts harnessing the full experience and know-how developed to date by Sunreef. This Blue Reef Yachts creation is the result of a strategic partnership between Sunreef Yachts and CDR Yachting based in France, Bordeaux. CDR YACHTING will lend its expertise in the design and sales of this new power yachts range. 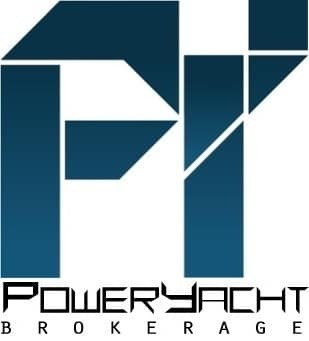 The team composed of Pierre Couach, ex sales director at the Couach shipyard, Vincent Duchatelet, naval architect and Franck Reynaud, exterior and interior designer have launched hundreds of motor yachts over the last twenty years, which is the guarantee of the future joint success of this venture. Both companies have noticed that the demand for boats that are technically reliable, aesthetically elegant and destined to navigate in comfort without a large crew is still unsatisfied. This is the reason why they have decided to join forces and form a partnership launching a new range of yachts, an offer geared towards owners wanting to explore the Mediterranean and traverse the seas docking at small, local marinas that cannot accommodate large superyachts. Sunseeker has taken a staring role in the highly successful ITV series, The X-Factor. The new series of the televised talent search, which started on Saturday 22nd August 2009, opened with four Sunseeker Superhawk 43s delivering the celebrity judges to the show's London auditions. Filmed on the River Thames in early August the opening sequence to the programme featured the judges Simon Cowell, Cheryl Cole, Dannii Minogue and Louis Walsh each arriving individually in a Superhawk 43, similar to the model used in the last Bond movie, Quantum of Solace. The sequence, which was shown on Saturday on both the ITV1 programme the X-Factor and on the X-tra Factor, its sister programme on ITV2, will be repeated in the first six shows of the series. This is not the first time a Sunseeker yacht has been the transport of choice for glamorous passengers cruising up the Thames. Last year a Sunseeker was used to transport the famous pop-band, Take That, to the O2 Arena for their sell out shows. Prior to that, and in another Bond movie, The World is not Enough, the film's villains drove a Superhawk 34 crashing into the river bank after being chased by James Bond, played by actor Pierce Brosnan. The X Factor is the biggest television talent competition in Europe, with 182,000 people having auditioned during the 2008 show. The prize is a £1,000,000 recording contract with record labels Sony and Syco, owned by judge Simon Cowell. This has been a year that summer eluded us cold, windy and rainy right up to July 28, the Rendezvous start date. Thankfully, the skies parted and we were blessed with some of the best weather possible. We’ll take it! Close to 40 boats participated in this year’s Rendezvous, including a few Pursuit owners, making it our first-ever combined Rendezvous. We had seasoned Rendezvous veterans along with many first timers. Events included bike rides, scavenger hunt, lunch at The Landings in Ironton Cove, Boat Hop and a great Customer Relations Seminar. One female boater said that she wanted to attend the seminar this year because in the past, the guys all came back laughing it up and clearly having a fun time with it. She wasn’t alone, as this year saw a record number of men and women joining in. The major event of the Rendezvous was a trip to Castle Farms ... A fantastic venue with great food, music, dance, tour and fun. We also had a surprise invite from a local resident who has a renowned home from the design table of Earl Young. We had over 50 people show up to see their professionally landscaped grounds on the shores of Round Lake. It was truly amazing. Tiara owners will meet again next year. Race 1 of the Romanian Grand Prix, round 3 of the UIM WPPA Class 1 World Powerboat Championship was packed with incident and accidents, with the peerless Fazza leading from start-to-finish to claim their second win of the season. Their team-mates and Championship leaders, Victory 1, continued their fine season with a third podium in successive races to take second place. Welmax had to battle back from eighth place after an incident with Victory 77 as they crossed the start-finish line for the first time, to take their first podium of the season. A spectacular 180 degree flip on one of the more docile corners of the course saw Maritimo 12 crash out on lap 7 and end their weekend’s racing. Defending World Champion Fazza, followed up this morning’s Edox Pole Position win with another dominant display. A near perfect start saw them get to the first mark ahead of Victory 1, and then produce a flawless performance to comfortably take the chequered flag and with it the joint lead of the Championship. Race 1 of the Romanian Grand Prix, round 3 of the UIM WPPA Class 1 World Powerboat Championship was packed with incident and accidents, with the peerless Fazza leading from start-to-finish to claim their second win of the season. Their team-mates and Championship leaders, Victory 1, continued their fine season with a third podium in successive races to take second place.Welmax had to battle back from eighth place after an incident with Victory 77 as they crossed the start-finish line for the first time, to take their first podium of the season. A spectacular 180 degree flip on one of the more docile corners of the course saw Maritimo 12 crash out on lap 7 and end their weekend’s racing. Fazza, followed up this morning’s Edox Pole Position win with another dominant display. A near perfect start saw them get to the first mark ahead of Victory 1, and then produce a flawless performance to comfortably take the chequered flag and with it the joint lead of the Championship. Victory 1, claimed a third successive podium place, the only team to do so this season, but they had to settle for second place as they were unable to claw back the time during the remainder of the race. The all-Norwegian pairing of Welmax, powered their way back through the pack to claim a well earned podium place. Despite making their way through the tail-enders in just five laps, it looked like they would have to settle for fourth place, until a hook by Australian boat Maritimo 11 on lap 11 allowed them to slip past and claim an unlikely third place. Maritimo 11 made a flying start to take third place at the end of the start-lap. They held onto the position for most of the race, but had to contend with the ever closing Welmax in their rear-view mirror. The need to push, forced them to go too hard into a corner and the resulting hook allowed Welmax to power past and take the podium they thought was theirs. Maritimo 12, saw their race end on lap seven, after flipping over on the bottom corner of the race course. Giorgioffshore, moved into fifth place on lap nine when a penalty long-lap was handed to Victory 77 for an infringement at the start. It was a good performance for the new pairing and fifth place equalled the team’s best result of the season from Doha, Qatar. For the returning Mohammad Al Marri and Abdullah Al Mehairbi in Victory 77 it was an incident-filled race. An infringement at the start, which they were later penalised for, resulted in them taking fourth spot at the end of the start lap, despite the collision with Welmax. A battle with Maritimo 12 looked to have gone against them until the Australian raceboats accident. The penalty lap cost them fifth place and they came home in sixth, only to find out they had been disqualified for the incident involving Welmax. A difficult day for Foresti & Suardi Roscioli Hotels, with battle conditions that did not suit their raceboat to finish in sixth place. It maintains their phenomenal record of completing every race since December 2006, and ensures more points on the board for the Italian team. Fazza completed the perfect weekend with a second race win in as many days, ensuring a clean sweep of the weekend’s honours. Welmax’s overnight repairs were rewarded with second place and Maritimo 11 made up for yesterday’s disappointment by taking the final podium place in Race 2 of the Romanian Grand Prix , round 3 of the UIM WPPA Class 1 World Powerboat Championship. Fazza claimed their second successive race win to storm to the top of the World Championship standings. Another phenomenal start saw them power to the front of pack and they never looked troubled as they cruised to their third race win of the season. Welmax took their second race podium in successive outings to put them into fourth place in the Championship standings. A good start saw them reach the first mark in third place and they were able to hold position to claim second spot after Victory 1 had problems on the penultimate lap. The third podium place was taken by Maritimo 11. After having seen a place on yesterday’s podium slip away, they grabbed the opportunity to make up for that today with a brilliant long-lap strategy. After a poor start their decision to take both long-laps in quick succession paid dividends as they made up time and places. Double world Champion, Mohammad Al Mari and Abdullah Al Mehairbi, bounced back after yesterday’s hectic and incident filled race, which saw this new partnership disqualified, to bring Victory 77 home in fourth place and post their first points of the campaign. Giorgioffshore matched yesterday’s fifth place with another impressive showing, however they will be frustrated with the two long-lap penalties they received for missing two turn marks, that ultimately cost them fourth place and what would have been their best finish of the season. There was bitter disappointment for Victory 1, who finished in sixth place, after seeing a podium finish disappear after running in second place from the start flag, when their steering broke on the penultimate lap. The all-Italian pairing of Foresti & Suardi – Roscioli Hotels maintained their record of consistency to add points, finishing in seventh place. A spectacular weekend of racing has seen Fazza dominate from first practice to the final race and return to the top of the World Championship standings, and move 15 points clear of their team-mates Victory 1. Maritimo’s second podium in three races keeps them in third place ahead of round 4 of the championship in Stresa, Italy, 2-4 October. A new website for Fashion Yachts Group, who is formed of two companies having presented its new super yacht franchise Politi Navi in the fall of 2008. Fashion Yachts is now the entry level sport yachts range of the Group starting from 55 to 116 feet, and Politi Navi is the specialized brand in building custom super yachts from 35 to 85 metres. Founded by Fabrizio Politi in 2001 as a service and brokerage company Fashion Yachts Group today is regarded as the fifth Italian yacht builder. The new website focuses on the extended size of the group which at present offers projects up to 85 metres. Fashion Yachts Group has at the moment 15 models, seven for Fashion Yachts, and eight for Politi Navi. The new virtual showroom of Fashion Yachts is available in Italian and English language and takes you in the following tabs: Home, The Shipyard, Fabrizio Politi, Management & Team, Events, Press, Video and Contacts. And finally we come to the last two preview projects of the eight new models Azimut will present in 2009. A record from the famous Italian builder! Both of these new models enter super yacht status being all over eighty feet in length. As all the Azimut models, the Italian builder continues the design work with Stefano Righini exterior, and Carlo Galeazzi for interiors. The first presentation above is the 88, what seems a further development of the 85 presented in 2006. The 88 apart adding further length to the 85 seems also to add more big view windows in the cabins. With a set of three vertical windows developed for the guest cabins. There is also a change in the owners mid ship cabin with now having four vertical windows, which if I am correct these also open up as the ones presented and being used for the smaller 58 Flybridge. The 88 will be presented in the Genoa show in October. The 100 Leonardo is the second super yacht to be presented by the Viareggio Turin builder. The project of the 100 Leonardo seems to be a further development of the 98 Leonardo highly improved in 2006 and as at that year delivered in 30 examples. Still with Azimut a new model is always a surprise, and this might be a totally new model with some innovative solutions. The 100 Leonardo will be launched in Cannes in September. Featuring many new design innovations to allow both crew and guests to live comfortably on board, the Tarquin Trader 75 Superyacht will be the largest Trader on the water and has been designed to provide the ultimate in luxury. Designers have worked cleverly on the new 75 Superyacht to ensure that guests and crew can be accommodated separately. Eight guests can be accommodated in four magnificent en-suite cabins, and two to three crew accommodated in a self contained crew suite, which has direct access to the galley, exterior decks and engine room, allowing complete separation from the guest party when required. Inside, the Trader 75 is light and airy having been fitted throughout with Anigre, a light tan hardwood, and a range of luxurious contemporary furnishings and fabrics. The main deck of the interior is a full 44ft from aft deck doors to windscreen and includes a full beam saloon, galley and dining area as well as a separate day head, wheelhouse with viewing seats and internal stairs to the flybridge. As with all Trader Motoryachts, below decks owners and guests have their own stairwells for greater privacy. The owners’ suite is aft and is a spacious 28ft. Featuring the signature Trader transom bay view window offering magnificent views as well as privacy, the 75 Superyacht is designed around the owner’s individual requirements. The comprehensive system design of the Trader 75 Superyacht utilises the finest components available and full collaboration with the suppliers has helped to ensure full integration. Designed with comfortable and independent passage making in mind, the systems required for this type of cruising are supplied as standard. Engine options Caterpillars from the smaller C15 at 850hp to the bigger C32 s at 1550hp. Performance figures with the middle option of C18 1000hp Cats is a max of 17 knots, with an 11 knots cruise, and economic long 1800 nautical miles long range of 9 knots. The first Trader 75 Superyacht was bought off-plan and launched in the UK last July, before going to its berth on the Italian Riviera. Until now, the largest model offered by Kadey-Krogen has been their 58 but the company believes there is room and interest for a bigger model so long as it can still be handled by a couple. The 64 Expedition is designed to be handled comfortably by two people, yet guests and/or crew can be accommodated with privacy for all as the 64' is available with multiple cabin and head layout options. The saloon of the 64 Expedition is located where every Kadey-Krogen saloon can be found: forward through the welded aluminum weather-tight doors off the fully covered aft deck. The port side galley remains amidships, directly adjacent to the saloon, so those who are prepping and cooking are still a part of the conversation. The galley is well appointed with top-of-the-line stainless appliances including a four-burner Viking range, full-size Jenn-Air refrigerator, a super-quiet Miele dishwasher, a microwave/convection oven, and trash compactor. As a first for Kadey-Krogen, there is a separate dining room to starboard, opposite the galley. The design crew at Kadey-Krogen can also accommodate owner needs and will ensure the 64 Expedition meets the needs and expectations of its purchaser. A wide walkway along the starboard side provides exterior access from the aft deck to the massive foredeck that is capable of handling a 17-foot tender and related equipment. For those that favor the looks of an expedition yacht but prefer to operate a vessel outside the pilothouse in fair weather, the 64 Expedition is available with a flybridge. Kadey-Krogen vice president, Larry Polster, believes this new boat gives the company an opportunity to showcase how it can cater to cruisers who favor designs with maximum interior space without compromising handling, safety, or range. He also points out the architectural integrity of the design and says, that Kadey-Krogen don't stretch boats. The 64 is built using a dedicated mold and like the 55 it incorporates three keels. Engineering aboard the 55 was so well received that it was natural for Kadey-Krogen to extend those features and functions to the 64, like offering again complete access to all machinery spaces from a single point of entry. Owners can move from the rudder post to the bow thruster through watertight doors in a machinery space boasting 6 feet of headroom. This feature makes the 64 unique in class and size, setting it apart from its competitors. The innovative three-keel design by Kadey-Krogen allows the Expedition model to have greater fuel efficiency than other keel forms. Each of the skegs to port and starboard is counter-faired, with the trailing end specially shaped to rotate water flowing into the propeller in the opposite direction of the propeller rotation resulting in greater operating efficiency. The balanced, easy to propel hull form combined with continuous duty 231hp John Deere engines gives the 64 Expedition a range of 3,000nm at 9 knots. Supporting equipment in the engine room includes fuel polishing, oil exchange, and fire suppression systems; hydraulic stabilizers as well as bow and stern thrusters; chilled-water air conditioning; and a universal power converter all are standard. Like all Kadey-Krogens, the hull is built using vinylester and isophthalic resins, knytex mats, and US-made CookAE UV-protected gel coat to protect the vessels color over time. Critical areas of the hull will be reinforced with a special impact-resistant fiberglass mat containing Twaron, the same fiber used to give body armor its "bullet-proof" capability. Twaron is an aramid fiber that is five times stronger than steel and up to 60% lighter than ballistic steel. This strong yet light fiber helps maintain a moderate displacement-to-length ratio that is a signature of Kadey-Krogen engineering and again results in better fuel economy.For the potential buyer wondering where the new 64 Expedition can take them, Kadey-Krogen says to simply choose a destination. Thanks to our British friends PowerYachtBlog is proud to bring exclusive preview spy shots of the new Princess 78 Motor Yacht. Third model model in size and number to be presented in the recently introduced Motor Yacht line up in the last two years by Princess, the 78 is a sleek looking boat just shy of super yacht size. I stand to be corrected to the project preview of a few weeks back where I said that the 78 Motor Yacht shares an identical hull to the V78 launched earlier on this year. This is in fact not so, as the 78 Motor Yacht is slightly longer and adds also one foot more to the beam versus the sporty V78. As for the rest the 78 Motor Yacht is a four cabin motor yacht and will be Princess second fully resin infused constructed yacht, the first being the V78. Princess is the first British builder to construct fully resin infused built yachts, and among the few European builders to embrace this cleaner building method. To my knowledge of the major builders in Europe only Italian Azimut has embraced the fully building of its boats using resin infusion for its line up under the 70 feet barrier. Defending World Champions, Victory Team, will be confident that they can tighten their grip and extend their lead at the top of the Championship standings in this weekend’s Romanian Grand Prix (28-30 August) on Lake Siutghiol, Mamaia-Constanta, round 3 of the UIM WPPA Class 1 World Powerboat Championship. The Dubai team has dominated the season so far, and after wins for both Victory 7 and Fazza, the in-house rivalry for bragging rights is building. Victory 1 currently holds the advantage and the number one slot with a five point margin over their team-mates, with Sanchez and Al Zafeen – now team rivals – who won together in Romania 2007, both aiming for the race win. All eyes will be on Maritimo’s two-boat line-up and Welmax to see if they can carry the fight to the Victory Team. Following the withdrawal of the Spirit of Qatar Team from the Championship, it is the Australian and Norwegian outfits who now stand as the main challengers to Victory’s title aspirations. Racing in Mamaia for the first time, Maritimo Australia will be looking to build on their double success last time out in Norway, when Maritimo 11, and Maritimo 12, landed their first podiums of the season. Team boss, Bill Barry-Cotter, will be aiming for greater consistency in Romania, but is confident that despite just three races under their belts, ongoing development of their new specification boat-engine package will result in increasingly competitive performances. Jorn Tandberg, who won in Mamaia last year to clinch the European title, and will be hoping to break free of the ‘propeller’ jinx that sidelined the MTI-designed Mercury V8-powered Welmax in the opening two races of the season. Tandberg knows a fourth career-win or a podium this weekend will kick-start his season’s fortunes and put his title defence back on course. Two solid performances this season, a sixth and a fourth place, see Foresti & Suardi-Roscioli Hotels currently in third place in the Championship standings, the Italian’s team strongest ever season-start, and Montavoci and Giampiero Soave will be aiming for continued consistency and reliability to add more points to their tally to defend their position as the leading European outfit. Giorgioffshore’s Nicola Giorgi will start with a third new wheelman in as many races, and brings in Norwegian Kurt Aage Olsen to make just his second start in Class 1. After a promising season-opener, taking fifth in Qatar, engine reliability issues in Norway have resulted in the team switching engine package to run SKEMA V12 power-plants. First official practice takes place on Friday afternoon, with a one-and-a-half hour session on Saturday morning for qualifying in the Edox Pole Position, followed by race 1 in the afternoon, 57.22Nm - 12 laps, including one long lap.A third official practice session on Sunday morning will be followed by race 2 in the afternoon - with the starting line-up determined by the results of race 1 - 71.35Nm, run over 14 laps, including two long laps - with both races counting for full championship points. Selene announce and present the newest project in the next generation series the 44. First delivery is to be in early 2010. Like the other next generation models, the 44 is designed to be a serious passage maker and a superlative coast wise and inland cruiser. As a next generation model, the Selene 44 features the Cruiser Stern. The new hull design results in nearly a one-foot increase in engine room headroom to 66 inches and allows plenty of room for the proven, standard Cummins QSB 5.9 230hp engine. The extra height also allows for expansion of the fuel tanks to a total of 1,000 U.S. gallons. Thanks to the extra height in the engine room, the tanks are designed to be narrower yielding even more space in the engine room. The new 44 replaces the 43 with an additional half a foot on the LOA increasing the interior saloon space by six more inches. Its innovative cruiser stern increases hull efficiency by around 8% as measured in tank tests. The increased hull efficiency translates into fuel savings as well as more sea-kindly handling in following seas. Evolved from the original Selene 43 which had a center line galley, the new Selene 44 has the galley offset to starboard providing a more spacious and accommodating saloon with easy access to the pilothouse. The pilothouse settee is L-shaped and also offset to starboard which creates room for a small helm chair in the pilothouse. With a spacious master stateroom forward, the new Selene 44 is ideal for couple’s cruising though an additional stateroom to port can accommodate occasional guests. There are two full heads with enclosed showers. Though the Selene 44 is at the smaller end of trawlers built by Jet Tern Marine she is equipped with many features like a washer/dryer and Frigoboat freezer usually found on larger yachts. Her engine and tank size make capable of long-distance cruising and at a 7.5 knot cruise speed the trawler will offer a 3,000 mile range. Formula 45 Yacht get a new up scaled look to its interior. Formula's flagship featuring already a designer Ralph Lauren cabin décor package gets improved and upgraded further, with a completely new cabinetry, Corian, flooring and doors which lend to a more luxurious feel to the beautiful Ralph Lauren fabric choices of Coastal and Mystic Cove. The 45 Yacht is the current biggest model in the Formula line up and offers a twin cabin en-suited interior. Power is from twin Volvo IPS600 435hp each. Abati Yachts continues to upgrade its modern lobster traditional boats line up, with the introduction of a further project to the 64 Freeport, now offered also in a Hard Top Version. The HT version discounts the flybridge up top of the standard version, offering for this an opening sunroof to the main deck and more sporty lines. 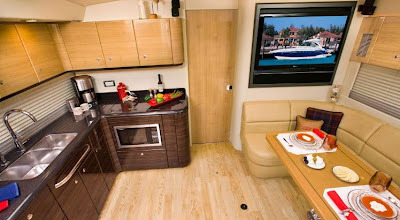 For the rest the 64 Freeport HT is identical to the Fly Version offering a three or four cabin interior, an exterior associated with modern Mediterranean spaces like an aft sun pad, and a forward settee with table. Speeds are an estimated 32 knots of wide open throttle thanks to twin MAN V10 1100hp, with a 26 knots cruising which gives an eleven hours plus of range. Italian Rib builder Sacs presents the 12 Strider S. The 12 Strider S is the third in size model of Sacs thirteen models line up. Designed by Christian Grande, the 12 Strider S unites rib exterior spaciousness together with an accommodating forward cabin, offering a two berth layout, and a shower head facility. Power is from a standard twin 400hp Diesel engines, coupled to Jolly Drives surface propellers. An optional more performing twin 480hp set up is also available. The 12 Strider S can also be added with more comfort, thanks to optionals like air condition, boiler, and electric cooker hob. The standard colors are orange as above or white, but further optional colors to personalize at your own taste are available. Fairline presents the project of the new 58 Targa Gran Turismo. Evolution took place at Fairline for the new project which includes some unique features. The concept here follows the single level living and galley space, which with a button touch starts a remarkable transformation as the huge roof glides smoothly open, and as an option this can have side windows that retract and a patio door that completely withdraws, effectively converting the deck saloon into a magnificent open air environment. An option of an integral powered sunshade provides protection for the aft cockpit seating, which can also convert into a huge sun pad at the push of another button. Flexibility to select your own on board lifestyle and environment, smoothly, effortlessly, and almost instantly is the theme of the 58 Targa Gran Turismo. Pioneering design continues below too, so the accommodation is superbly equipped and luxurious, setting high standards of biggest and best in class. An elegant swept staircase with its light and airy atrium and utility area to one side leads to a unique layout below deck. Locating the en suite forward of the master cabin, Fairline have taken full advantage of the huge beam to create a stunning cabin for the owner that is the largest and lightest of any yacht in this class. Fairline impresses also more with the two sumptuously appointed VIP guest cabins which also have spacious en suites, and both are convertible from twin to double cabins according to preference, while the lazarette, with its elegant transom glazing, can also be specified as an additional and unusually light cabin. With the 58 Targa Gran Turismo, Fairline seem also set to compete with the Italians on the amount of view windows on the hull sides. Speeds for the new upcoming second in size of the Targa fleet go from slow 30 knots speeds with twin Volvo's D12-800 up to a high performing 40 knots with twin MAN V8 1200. Propulsion is for traditional shaft drives. 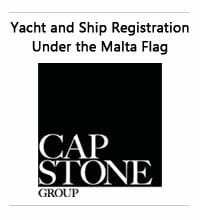 CNP the acronym standing for Cantiere Navale di Persaro an Italian ship builder standing on the Adriatic side of the European peninsula, presents the 105 second model in its Naumachos yacht line. As the rendering clearly shows and as was the case for the first model the Naumachos 82, CNP present an explorer tug looking super yacht, with a sturdy built able to withstand all weather conditions, along with a long range capability. The 105 follows these themes but with a greater size following clients requests to CNP. 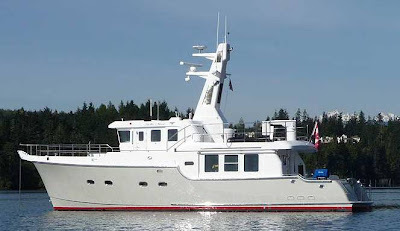 The Naumachos is sold as a semi custom project, all to the same plans outside but different inside where layout, furnishing materials, engines, and equipment is too owners request. The standard interior layout for the Naumachos 105 is a four cabin layout, with the owners cabin on the main deck, and three cabins below. Engines are twin Cats C18 Continuous Duty 456hp, which deliver a wide open throttle speed of 12 knots, cruising at 11 knots, and a long range 10000 nautical miles speed of 9 knots. Construction is for a steel hull, with alloy super structure, and building by Cantieri Navali di Pesaro is done to RINA or Lloyd's registry requirements with MCA Compliance available. Scarani Boats presents its new 30 Day Cruiser. An interesting and innovative new model offering exterior spaces associated with a center console, and a living capability of a more bulky looking sport cruiser. There are many interesting features for the 30 Day Cruiser which make it deserve a good look if one is looking for boats of this size. First is surely the welcoming exterior with its l-shaped settee, which transforms to a mezzanine looking aft, its big forward sun pad, walk around deck, exterior galley with sink, and large extended bathing platform with space to stow a tender. The interior considering the all usage of the exterior is full of space too with a 2 + 2 accommodation featured in a double mid cabin, and convertible vee berth. There is also a galley and also a spacious shower head. An unusual optional feature is also shown in the choice to isolate the mid cabin with a privacy bulk head and private door entrance. Interior style is in minimal with refined fittings in bleached oak wood. Engine options are single or twin petrol or diesel, propelled with efficient stern drive. Ferretti Yachts will go to the Cannes 2009 boat show with a fresh and creative renewal wave giving shape to the 560 representing according to the Italian builder a revolution conceived to experience a new feeling of life on board. Through this new model the shipyard aims to consolidate and continue the evolution process of the flybridge range under 63 feet. This renewal started with the 630 and was followed in the last two years with the launch of the 470, 510, and 592. The 560 resembles these models with the shape of the 360 view window in the main deck, along with the flybridge which with its aft mounted radar arch aims to create the best undisturbed space up top. Ferretti 560 continues the never ending cooperation between Advanced Yacht Technology of Ferretti group and Studio Zuccon International Project. The 560 project criteria meeting a new evolution could be identified in three key-elements: an innovative space-design of the lower deck layout with three cabins which include a full beam owner suite and three bathrooms, a very strong care for details embodied by contemporary taste decor elements such as bleached oak, and last a new exclusive design of windows to enhance natural light on board. As a result, Ferretti 560 is unique in her category, created to meet the desires of demanded customers, offering the high standards of live ability through the combination of wide spaces, quality materials, comfort and performance. Ferretti 560 will be powered by twin MAN 900hp engines that push the yacht to a cruise speed of 28 knots and max of 32 knots. 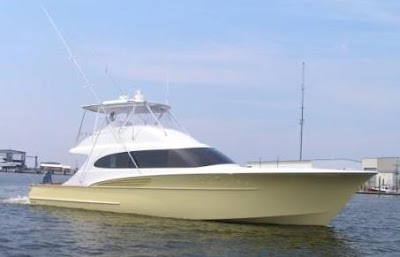 Viking presents another blue water family member, the anticipated and expected 57 Convertible. Featuring a robust hull with a beautiful sheer, a curvy, creamy smooth deckhouse with Viking’s new teardrop window lines, a low profile wraparound flying bridge and a 157 square feet cockpit, including a spacious observation mezzanine, the result is an exciting model in the Convertible line tradition. Ideally suited for tournament fishing, as well as long distance cruising, the 57 Convertible features a three-stateroom, two-head layout for plenty of comfort and privacy thanks to the offset companionway, which utilizes space to its maximum efficiency. With the master stateroom featuring an athwart ship queen size walk around bed, the VIP cabin is located to fore and has a queen size berth, and the third guest cabin located to port has upper and lower bunks. Upper and lower cross over three berths also are available for the forward stateroom in replacement to the standard twin queen size bed. Standard power is MAN V12 CRM 1360hp diesels. A package with twin MAN V12 CRM 1550hp is also available as optional. Speeds will range from a mid 30 knot cruise to a top end approaching 40 knots depending upon the power selection, load and sea conditions. As Azimut highly anticipated at the end of last year, the 2009 will mark the presentation of eight new models. The first new model presented was the innovative 53, previewed during the Yachting Gala. 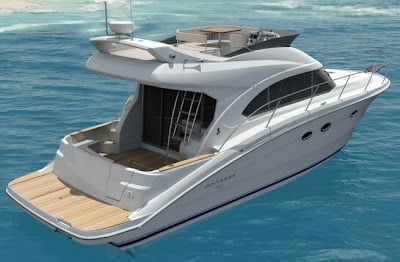 PowerYachtBlog also gave an exclusive detailed anticipation to the new 38 Flybridge which Azimut in cooperation with its British dealer Clipper Marine will present at the Southampton boat show. Now is the turn to present four Azimut projects to be unveiled during the important shows the coming fall. Azimut gave little details of the new models so the comments here are a guess of what can be seen in the rendering images. Surely as is in all the new models of the Italian builder, the exterior design is entrusted to Stefano Righini, with Carlo Galeazzi taking care for the interiors. The first of our presentations is the Azimut 78 which looks to be a further development to the 75. The new 78 apart length adds also opening view windows in the cabins. With the single big view window in the owners stateroom, now replaced by a set of four vertical windows which also open to allow a natural flow of air. The Azimut 74 Magellano, has finally arrived. Paolo Vitelli President of the Azimut Benetti Group has given hints for this projects in his past interviews and finally it looks to be here. If his interviews are correct the 74 Magellano will have an extended range of round 1000 nautical miles, with max speeds in the low twenties, and cruising of around fifteen knots. This will be the last debuted of the eight new models for 2009, with November month being announced as its launching date. Still it is also the most expected from the media as well as the yachtsman. The year 2009 marks new additions to the Azimut S line, after an absence of 2 years. The 103 SL was the last new model presented for this line during the Dubai Show of 2007. Now the 72S is the next upcoming model and is set to be presented at the Cannes show. As the rendering clearly shows the 72S will have a sport bridge offering a second helm station up top but without disturbing the sleek lines Sport Yacht looks. This is the second Azimut with a sport bridge, with the only other being the 103 SL flagship of the line. Azimut presents also a new smaller S line model, with the 40S. So far no details are announced but imagine a similar two double cabin two head interior, as is the case for the new entry level 38 Flybridge. In the beginning of Summer Nord West launched a first boat the 370 SportsTop with a new system called Stern drive Joystick. Similar to the IPS this new drive system has electrical steering, and manoeuvring in harbours can be done very easily thanks to easy to use joystick control. Nord West was among the first users of Volvo IPS system as well as being among the first to make a special designed hull for the propulsion. Every boat can be installed with a maximum of 4 joystick controls. With the new system stern drive with joystick Nord West adds as promised an other third model with this easy to use option, the 420 Flybridge following the 370 SportsTop and 370 Coupe. The 420 Flybridge is also a bit unique for being among the larger sized stern drive available flybridge motor cruiser. Surely with the easy to use joystick control added with the efficiency stern drives offer, this option will start to make more sense in the 420 Flybridge much more than any other model. Sunseeker presents the new 64 Predator, a further development of there high performing Sport Yacht range. The 64 Predator is a replacement to the 62 and continues to upgrade the Predators which start from the 52 and go up to the soon to be launched 130 flagship, which for a short time will also be the flagship to all the Sunseeker range. Sunseeker continue to offer versatility to there packages offering in the 64 Predator a standard three cabin version, or optional two cabin with a lower saloon offering an l-shaped sofa. The standard three cabin version is a traditional plan for modern Mediterranean Sport Yachts, with full beam owners cabin, VIP cabin to fore, and l-shaped double bunked cabin to starboard in between the two cabins. There is three heads with two being en-suites for the main VIP and owner cabins. The galley is also on the lower deck to port, with the main deck saloon being left for entertainment and relaxation purposes. As for carrying your water toys the 64 Predator offers space for two personnel water craft spaces, with a tender garage offering capacity for a jet rib, and low hi bathing platform where one can also put a jet bike or similar. Power is from twin 1100hp engines with traditional shaft line propulsion in semi tunnel propellers. Speeds peak a max of 35 knots and a cruise of 28 knots. From this year onwards, all Antares models over 9 metres will have their length in feet included as part of their model name. And that’s the case with this new launch, which replaces the 9 Series with 30 Flybridge/Hard Top versions. As the first Flybridge in the range, it is designed primarily for cruising, and retains all the excellent sea keeping qualities on which the Antares reputation has been built. Sarrazin Design presents a sleek elegant line, and their style is unmistakable for the Antares 30. Its grey-tinted glass makes a special contribution to the sophisticated modern looks. The hull is the work of the Beneteau design team, and is available with a single-engine configuration only. There will be three versions to choose from the 30 Antares. 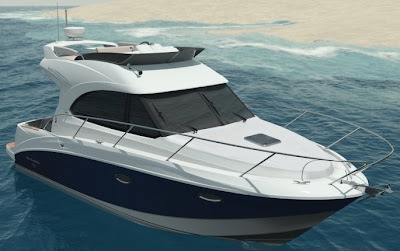 The S version is with hard top with two opening panels, with flybridge but no helm station featuring a large sunbathing area and settee with table up top, and with flybridge and helm station convertible to a sunbathing platform. According to Beneteau the amount of living space is unrivalled by any other boat of this size. Accommodation is a four berth lower deck with a convertible saloon to double berth. The guest cabins are an owners double to fore, and a double bunk to port. To starboard is the fully equipped head. 30 Antares will have max single engine power up to 380hp, and will be certified to CE B standards. If the above statement stands true the 42 Antares will be a replacement to the 12 Antares. Beneteau has so far given little details for this new 42 Antares model. What can be seen is that the project rendering above builds on bigger spaces to the 12, like more extended bathing platform, and a larger flybridge. The flybridge will feature a c-shaped settee to port, helm station to starboard, and a sunpad looking aft. The interior will also features a main living deck with a main saloon welcoming you inside to a c-shaped settee to starboard upon entrance, a 2 person settee to port, l-shaped galley to port, and double helm seated helm station again to starboard. The lower deck layout has not been so far confirmed although this layout lets the thinking go for three cabins below. Propulsion has also not been announced, but the 12 Antares was available with both shaft and IPS pod so accept again to have this format. 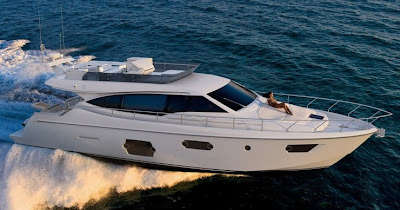 Beneteau upgraded its Sport Cruiser line in December 2008 with the launch of the 47 MonteCarlo. The range is now being extended again with the launch of the Flybridge version: a 47 MonteCarlo Fly featuring a large sunbathing terrace up top with sporty looks. The external cockpit galley unit has been cleverly converted to provide access to the flybridge. The designer of the MonteCarlo range Pierangelo Andreani has drawn a new design in true Mediterranean style. The overall layout of the 47 MonteCarlo Fly offers two living spaces: the cockpit and the flybridge. The flybridge incorporates two distinct areas: the helm station and the convertible 6-person settee. The driver's seat is on the centre, with the instrument panel featuring a full set of double navigation instruments, to the left is the co-driver’s seat, and to the right a large lounger-style sunpad with a pullout fridge beneath. Behind is the six person settee. Worth to note is the visually appealing radar arch which carries the radar and antennas is raised to not disturb the views to the owner and his guests. The large cockpit surprises for a flybridge offering an external galley unit, and has an external settee which converts into a sunpad, of which underneath is located a tender garage that can accommodate a tender with outboard. Inside the 47 MonteCarlo Fly continues what we seen in the standard hart top version presented in Paris last December with generous living spaces of which the striking feature is the full beam owner’s cabin flooded with light from two large side windows, but also the choice of layout versions for two or three cabin plans. New leather, alcantara and light oak finishes will also be introduced for the new 47 MonteCarlo Fly. The 47 MonteCarlo hull design has been developed in close co-operation with Volvo Penta to accommodate IPS pod drives. 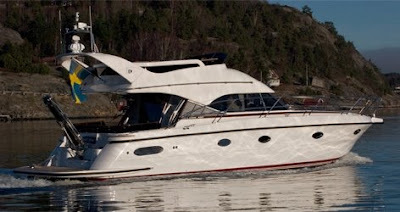 Power for the 47 MonteCarlo Fly is from twin Volvo IPS600 D6 435hp diesel engines. Following ownership change to Fleming Yachts management, UK builder Corvette presents its new 320, representing a bit of a unique Explorer Cruiser thanks to many cross over features. In fact the new 320 unites the world of faster planning performance to that of a displacement explorer cruiser with unique spaces for its size. Just to make a note the 320 offers accommodation for two cabins, two head plan providing a level of comfort and privacy found only on larger boats. Another surprise is also the performance, which with its traditional, salty looks makes you think trawler, but the 320 will surprise you here too with 25 plus knots speed, and its sea kindly performance. Cruise leisurely and economically all day long at 7 knots or hit the throttles and get to your next destination before the weather turns ugly. Another surprise is that while many boats in this size range offer only single engine power, Corvette took the safety and improved handling route that comes with twin engines, which assures of getting home if you experience a problem with an engine, transmission or running gear, and there's nothing more maneuvering into a tight slip with twins under your command. Corvette also says that the cost of maintaining two smaller engines is the same, as are the running costs concerned with the fuel, versus a bigger single unit. 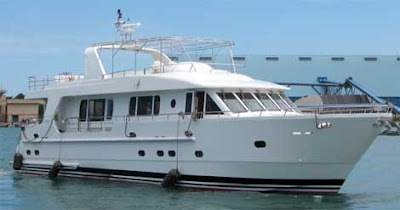 The well thought out deck plan of the Corvette 320 provides the outdoor living space of a 40-footer too, with the helm on the flying bridge being the perfect place to run the 320 in good weather featuring a double helm seat plus two additional, built-in seating areas allow the crew to join the captain while underway. Aft of the flying bridge is an outdoor dining and lounge area complete with two settees and table. Last note is that Fleming is promising the quality of construction and choice of materials associated with its bigger explorer yachts line. The 320 as well as other future Corvette models will be built at the Tung Hwa facility in Taiwan, where the World famous Flemings are also being constructed. John Deere Power Systems is pleased to announce a new patented PowerTech HazLoc diesel engines. Built upon John Deere's proven 8.1L platform, the PowerTech HazLoc 6081HFH70 diesel engine received United States Coast Guard Marine Safety Center certification for Class 1, Division 1 Zone 1 Groups C & D hazardous locations. The PowerTech HazLoc electronically governed diesel engines are certified for use on board USCG–certified subchapter D & O vessels. As electronic engines have become more commonplace, engines installed in these marine applications are required to meet weather-deck requirements for electronics as directed by the USCG in United States-flagged vessels where there is the possibility of an explosive atmosphere in normal operations. A Class 1, Division 1 Zone 1 area is defined as being within a 3 meters radius of any source of gases that could create an explosive atmosphere, including tank vents, sounding tubes, valves and pumps. Any engine that operates in these conditions must meet these requirements. John Deere is the first diesel engine manufacturer to receive USCG MSC certification for Class 1 Division 1 (Zone 1) group C & D hazardous weather-deck locations, for electronically controlled engines. The John Deere PowerTech 6081HFH70 has 8.1L of displacement and offers up to 242 kW - 325hp at 2100 rpm. 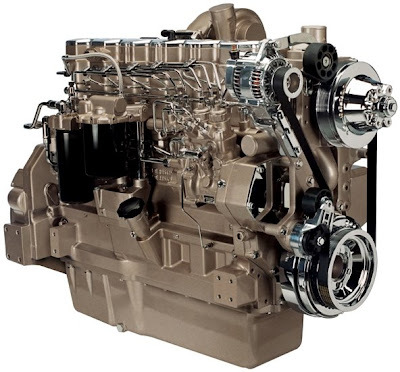 The 6081HFH70 is a 6-cylinder, electronically controlled, turbocharged and air-to-air aftercooled industrial engine for use in marine auxiliary applications. The development of the Hunt 29 Harrier was driven by the success of the smaller 25 Harrier, with customers asking for the same style on a larger platform. Harrier 29's increased length takes advantage and use of the 29 Surfhunter hull, already well proven and widely admired for its capabilities, efficiency and performance. The Harrier 29 is intended to be more of a day boat, which is immediately obvious in the huge and inviting cockpit. An on-deck galley makes entertaining even more fun, with helm and companion seats, L-settee, engine box and cross-transom seating for ten, and with superb visibility for sightseeing made even more appealing by the soft, dry ride for which Hunt Yachts are so widely praised. The forward cabin includes V-berth, enclosed stand-up head and stowage, all this without loosing and affecting the sleek, classic profile. Available engine is for six options, all single from Volvo or Yanmar, and in petrol gas or diesel format from 315hp up to 435hp. Hunt Yachts also offer a wide variety of propulsion form stern drive, to the traditional shaft in vee drive configuration, and jet propulsion for the least in draft. Speeds are estimated at a max of 36 knots with cruising of 30 knots. Riva announces its next new model with the project of the 86 Domino, what will be the new Sport series hard top flagship. The 86 Domino also adds another Super Yacht to the Riva line, which now has four models over eighty feet. Lines where again trusted to Riva designer Micheli and his Officina Italiana Design. An architect who started his career with the company in 1984 and has since then established a never ending relationship with the renowned brand. So far Riva has given practically no details of the new Super Sport Yacht the 86 Domino accept for the above rendering image, but if one likes the looks you surely need to go to Cannes on the 9Th September to have a preview and get the scoop. The new Nordhavn 52 is based on the 47 model, with P.A.E.’s designers actually extending it by five feet. The Nordhavn 52, is an evolution of its smaller sister, with more interior space and longer offshore capability to the 47. The new 52 differs itself from the 47 with three central design modifications, each of which combines to make a sleeker and slightly more efficient boat. The most significant of these changes is a cockpit extension, which opens up the rear of the boat as well as elongates the yacht’s lines. Other benefits is of added waterline length which is not limited simply to aesthetics. The design team was also able to work an extra approximate 800 litres of fuel into the capacity of the boat’s tanks and in turn, bump up the range. To coincide with the elongated cockpit, the upper level boat deck was lengthened by two feet, serving a dual purpose: not only does this offset the cockpit extension, it enables a bigger tender to be carried on top. Completing the enhanced look is the re-configuration of the flybridge. A purely cosmetic change with no features added or altered, but the newly-styled flybridge is now more integral with the boat deck and pilothouse roof. Despite these sublte differences and improvements, the new 52 follows the rest of the Nordhavn line, in a robust construction, superior level of fit and finish, and an ability to deliver her owners anywhere they wish to travel in safety, comfort and luxury. Princess presents its new 78 Motor Yacht. This new model will be debuted at the home waters Southampton boat show, and my general knowledge tells me it will be a replacement to the 23 Metre, but still no official word from Princess about this. I also imagine the new 78 Motor Yacht to have a similar if not identical hull to the V78 launched earlier on this year, and which made its official debut in Antibes last Spring. As the V78 the hull of the 78 Motor Yacht will also be resin infused which will give a cleaner build, along with a less weight per strength construction. Princess is the first British builder to use resin infusion for its hulls. Accommodation details are very minimal so far from Princess which says the new 78 Motor Yacht will have a four cabin en-suited interior. Engines have also not been announced but accept similar options to the V78 but with less speeds due to the extra weight and wind drag of the flybridge. Sabre Yachts first used pods on the 42 Express and the results were truly impressive. Sabre is now offering also the 38 Express with Volvo IPS drives and this application too changes the way this already great design handles at the dock and underway. The choice for the IPS pods in the 38, was simple is that the Volvo set up fitted under the cockpit deck using the existing molds whereas the Zeus pods did not fit. Performance figures published by Sabre for the 38 Express with IPS450 D6-330hp engines are a wide open throttle max speed of 31 knots, and a continues cruising of 26 knots which gives a range of 292 nautical miles. 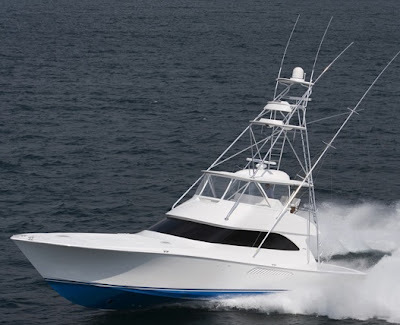 Freedom Boatworks has launched the much expected 56 Sportfisherman. This is Freedom second built following the launching of the 77 we presented here a few weeks back, which was completed earlier on this year. The 56 Sportfisherman is built as the 77 in cold molding technique with a male jig system. Power takes a bit innovation on the just launched 56 thanks to the use of triple Volvo IPS900 700hp engines. This set up gave a top speed of 42 knots in the first sea trials, with full equipment, twenty persons on board, and half fuel tanks. Economy cruise speed was 30 knots with consumption at only 190 litres per hours at this speed. Freedom declared that she was also a bit under propped so may be they accept something more of peak speeds. Thanks to the IPS engines the 56 Sportfisherman also manages the space of much bigger Sportfish Yachts with the lower deck offering four double cabins, and three heads. The owners cabin is also a much sought full beam mid ship cabin standing to the length of the yacht, which to my knowledge is a unique feat so far on a custom cold molded seventeen metre sportfish. As the 77 the 56 Sportfisherman was built by renowned builder Jim Polatty who with it completed his nineteenth construction. As the 77 design was done by Applied Concepts of Florida.